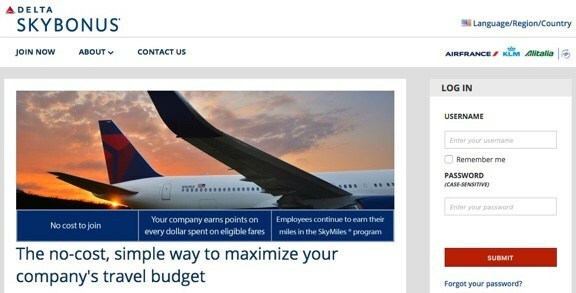 Delta SkyBonus is a rewards program for small and medium companies. You can exchange points for flights, upgrades and more. How do you use them for free flights? Follow our step-by-step guide. Delta SkyBonus is a rewards program for small and medium-sized companies. Your company can earn SkyBonus points whenever your employees fly Delta (and some partner airlines). If you are not a SkyBonus member you can sign up here. What is the difference between SkyBonus and SkyMiles? SkyMiles is a frequent flyer program for individuals while SkyBonus is a rewards program for companies. SkyMiles points are completely different from SkyBonus points. They cannot be transferred between programs and you use them in a different way (but both can get you almost free flights). The best part is that you can "double dip", which means each person can earn both personal Skymiles and company Skybonus at the same time (as long as the traveller is a company employee and flying for business). How do I earn SkyBonus points? What can I do with the SkyBonus points? You can use them to book flights as well as drinks and headsets on Delta, club passes and and even elite status. Also, a good use are upgrades from economy to comfort+ or business class. How can I use SkyBonus points? You will see the total amount of your points to the right side, as well as number of points expiring this year. 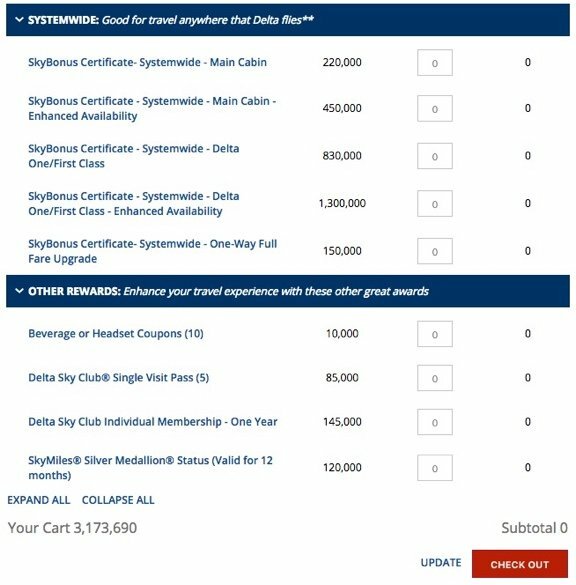 The lowest amount of points you can use is 10,000 (a coupon for 10 drinks or headsets on Delta flights) and the most expensive item is a first class ticket to anywhere Delta flies for 1,300,000 points. Firstly, add the rewards to the basket. Secondly, go to check out. Thirdly, exchange the points for reward vouchers. Really, is it that easy? Unfortunately not. It's easy when it comes to non-flight awards, like club passes or elite status. Once you have the voucher, you can easily redeem it for someone. However it gets more complicated with flights. You can't use the vouchers for any flight as only certain flights will be eligible. For example, if you take a look at South America rewards, there are 2 certificates in main cabin and 2 in first class. One is regular and the other in enhanced availability. Once you order a voucher, you'll be able to redeem it for flights online or by phone. It is crucial to check flight availability on the dates you need because once ordered all vouchers are non-refundable. How do I check which flights are eligible? When you click on the certificate details will pop up. 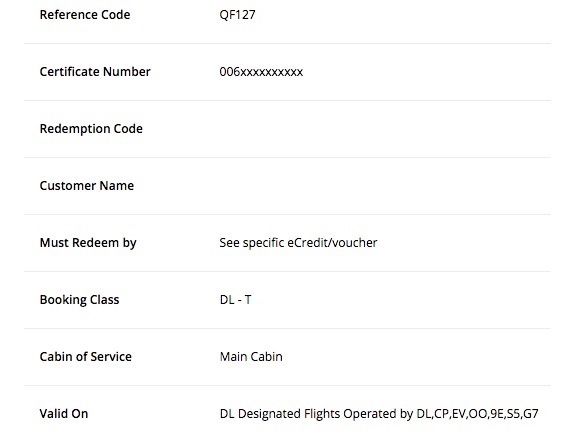 You will see "Booking Class DL - T" which means that a voucher can be redeemed in booking class T only. Similarly, "enhanced availability" vouchers are valid for fare class Q only. Go to Delta.com and click "Advanced search". 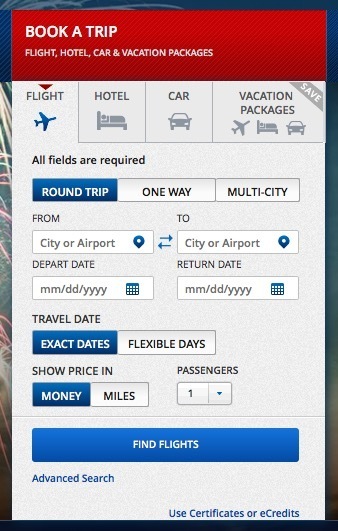 Under "Search by" switch to "Fare class" and select the fare required by the voucher. Eg. if you're booking standard reward to South America, you need "Booking class DL - T", so select "Main Cabin T (or higher)" from the dropdown list. Select your origin/destination, departure/arrival and click "Search". On the results page, if you see "Main Cabin (T)", it means that T fare is available on this flight. However, if the above the flights you see "Main Cabin (U)" or even "Main Cabin (T),(U)", the flight will not be available using the voucher. Another important thing is that the flights have to be operated by Delta. The only exception are flights between North America and Europe, which can be operated by KLM, AirFrance or Alitalia. If you found eligible flights, just go to www.delta.com/redeem, enter the voucher code and book the flights. As always, please remember that flight availability is changing constantly. Once you confirm the availability, issue the reward voucher and book immediately. You need to pay for the taxes on top of the voucher, it's $5.60 for domestic flights and $50-150 for international. The price is the same for a one-way and a round-trip so booking a round-trip is a no-brainer. Also, open-jaw flight are not permitted and you will earn no frequent flyer miles on tickets booked with Skybonus. How can Flightfox help me? On top of helping you with SkyBonus, you can have all your company travel managed by our concierge team. For office managers or executive assistants it saves hours planning, comparing and reconciling work trips. We guarantee savings on your travel spend and provide upgrades and elite perks.